Impulse buying. It's tough to resist some of those store displays. Or seeing something you haven't enjoyed in quite some time. Especially in a store like Market District. Usually, SP does the grocery shopping without me, which cuts down on the impulse buying because if I am not there, he won't go 'off the list' because I'll give him a hard time when he gets home. But when we go together, we both are likely to let the other person impulse buy because we like to make each other happy. It's no secret that I like treats. A lot. I try to avoid treats like chips. They're salty, fatty, and usually leave a yucky taste in my mouth (here's looking at you, Cool Ranch Doritos that taste so good yet leave me feeling so disgusting afterwards). I'm not always successful. Sometimes, SP brings home little bags of stuff like Sun Chips and before he can get them to his desk drawer at work (for afternoon snacks), I've pounced. Mmmm cheesy Sun Chips. Sometimes, as hard as I try to not make eye contact with the treats in stores, it just happens. Like this past Saturday when we cut down the chip aisle to go find the pasta aisle and right in front of my face was a wall of Cheez-Its with huge "SALE' signs. 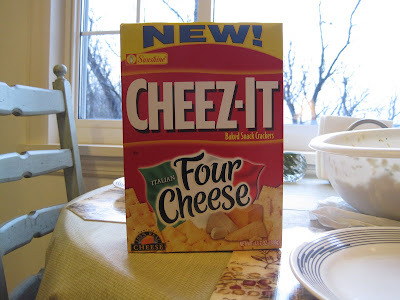 I stopped and pointed and said 'Cheez-Its' in a way that made SP laugh and ask which kind I wanted. How could we possibly resist on sale Cheez-Its??? I hadn't had Cheez-Its in years. They have been a nice afternoon snack this week while I worked my through some books and magazines in the 'To Read' pile. Cookies. I love baking and for the most part we bake our cookie treats or buy bakery treats. Rarely do we buy packaged cookies and if we do, it's almost always Pepperidge Farm. SP found these in the cookie aisle and wanted to try them: I think these are just OK. 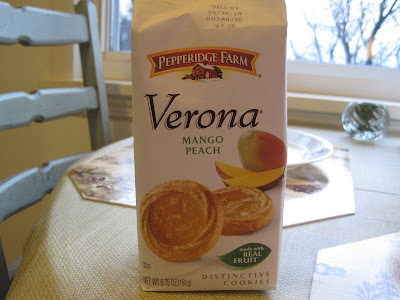 Some Pepperidge Farm cookies (including these Mango-Peach Verona cookies) were on sale at WalMart and SP likes mango-peach flavored foods, so we bought a package. I prefer the Milanos. 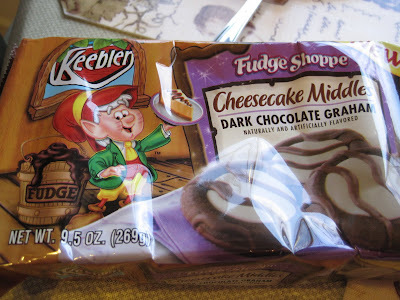 I used to love the Keebler Elf cookies, especially those EL Fudge sandwich cookies - and especially the double stuffed ones! The Fudge Shoppe Cookies are good, too. And the Sandies. Keebler Elf cookies were great to take to work for a quick treat in the afternoon - either to fill a grumbly tummy or a quick way to cheer myself up!! 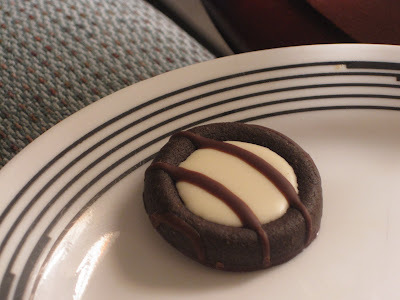 We had a coupon for a new kind of Fudge Shoppe cookie: These are pretty good. I might not buy them again since I like the Grasshoppers better. But they're pretty good for a store bought packaged cookie. The cookies were sort of impulse buys - we always have a treat after dinner and we knew we weren't going to have time to bake so if we wanted cookies we had to buy them. They were on sale/we had a coupon. And, they're medically necessary!!! We have to have treats on hand for when SP's blood sugar goes low and he needs a quick something to bring it back up. 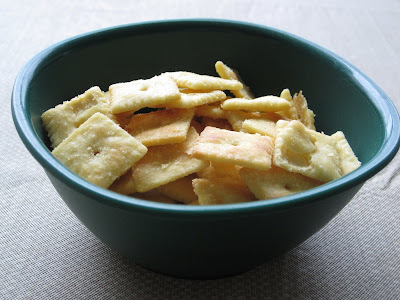 The Cheez-Its - well, those were absolutely an impulse! Next trip, we're avoiding the chip aisle. If I don't see them, I don't think about them, I don't want them. I never put chips on the grocery list. I am never at home and craving chips unless I know we have them in the pantry. But if I know they're in the pantry, or if I am in a store and make eye contact with Fritos... or Sun Chips... or Cheez-Its... or Swiss Cheese Crackers... it's usually a losing battle and I have to have them. And then I rip open the bag and snarf them up. And feel gross. And blame SP who just raises his eyebrows and laughs at me. I will admit that we keep some sort of cheese cracker around. I mean, I need them in my life. I just try not to eat tooo many.